In the Western Pacific Ocean: Tropical depression (td) 03w (Three), located approximately 170 nm east of Davao in the Philippines, is tracking westward at 16 knots. In the Southern Hemisphere: Tropical cyclone 19s (Savannah), located approximately 1115 nm east-southeast of Diego Garcia, is tracking west-southwestward at 08 knots. 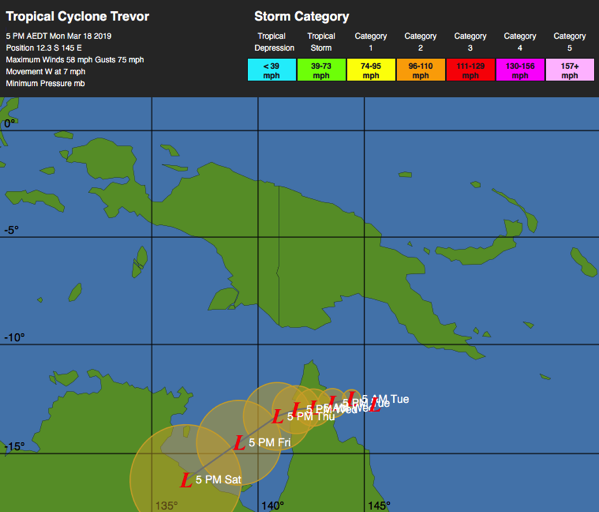 Tropical cyclone 20p (Trevor), located approximately 280 nm north of Cairns, Australia, is tracking westward at 07 knots. Indonesia – Flash floods and landslides triggered by torrential rain in Indonesia’s easternmost province of Papua have killed at least 58 people, injured dozens and displaced more than 4,000, authorities said on Sunday. A search for more possible victims was underway in the town of Sentani, which was hit by flash floods late on Saturday. Fifty-one people were killed and 74 injured there. Heavy rain caused landslides in the nearby provincial capital of Jayapura, killing seven there.